Describe what you see in this 70 year old rather obese patient who recently underwent phaco/trab ? The attached photo suggest pupillary capture of the IOL with inferior displacement of the IOL in front of the pupil. Note that the patient has adhesions between the iris and cornea on teh nasal side and some scattered else where. This presentation is typically seen in a patient who experienced shallow to flat chamber in the immediate post operative peroid, most likely secondary to posterior push mechanism (choroidal effusions) and less commonly following overfiltration or leaky bleb. 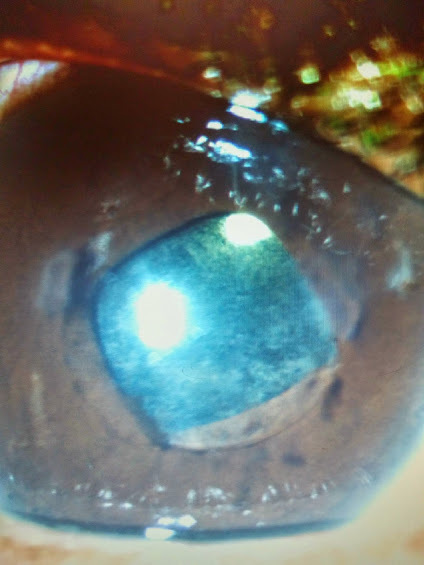 Surgical techniques that will prevent this problem include a 6 mm capsulorehxsis (vs a large 8 mm) that will prevent IOL prolapse and tight closure of the trab flap. Mangement of this complication: At the slit lamp, one can use a 30 G needle on healon cannula to both push the IOL into the bag and break teh iris adhesions. Make sure to prep the eye with betadine for antispesis first and lidocaine topical anesthesia.